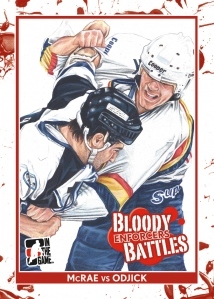 Over the last week, In the Game has become a lightning rod of controversy thanks to the mainstream media buzz surrounding its upcoming 2011-12 In the Game Enforcers Hockey cards. Starting with a post on the popular Puck Daddy blog, news outlets around North America are raising their pitch forks at the company for making a set about the history of hockey's tough guys. Even a player featured in the set has asked to have his card changed or removed all together. Despite the controversy and negative attention 2011-12 ITG Enforcers is getting, the publicity has actually led to a surge in curiosity.
" way more interest now," says In the Game President, Dr. Brian Price. "Now the casual fan is interested in the product along with the die-hard collector. The hits to our website have been astronomical." Since the off-season deaths of tough guys Derek Boogaard and Wade Belak, fighting in hockey has become an increasingly touchy subject. Combined with a rising sensitivity and education about head injuries in not just hockey, but sports overall, and In the Game finds themselves in the middle of the debate. "Our cards have become the whipping boy for the hockey anti-fighting crowd," continues Price. "Hockey fans and card collectors are in favor but non-hockey fans, non-collectors and the anti-violence in sports are not." Georges Laraque, a player who is not only featured in the set but has autographs as well, said in an interview that he wasn't happy with the cards. Specifically, he didn't like the use of blood in the design. Laraque, who made a career largely based on being an intimidating force on the ice, asked that In the Game either remove the bloody design elements from his cards or remove him from the set all together. In the Game has said they will do neither as Laraque signed a contract and they are within their rights to make the cards as planned. This isn't the first time fighting has been portrayed on trading cards, so why the controversy now? 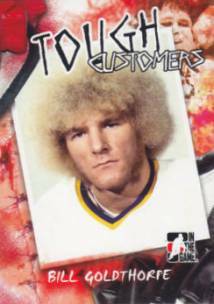 In the Game produced cards called Tough Customers years ago, including an even more blood-soaked design back in 2005. Boxing cards have been around for more than a century. More recently, Topps, Upper Deck and Panini have all made Mixed Martial Arts cards. "We know the true purpose of our product and it is not to glorify fighting," notes Price. "I am sure that if the public knew about MMA cards there would be an outcry as well. Just the society we live in." 2012 In the Game Enforcers is scheduled to come out in mid-January. Each box of 12 cards comes with five autographs and two game-used memorabilia cards. Bob Probert, Marty McSorley and Wendel Clark are among the players scheduled to be in the set. Brian Price continues to churn out the garbage. WENDEL CLARK SIGNED UPPER DECK QUEBEC NORDIQUES CARD AUTOGRAPH AUTO!! !